The operating desk set up for SKN 2011. 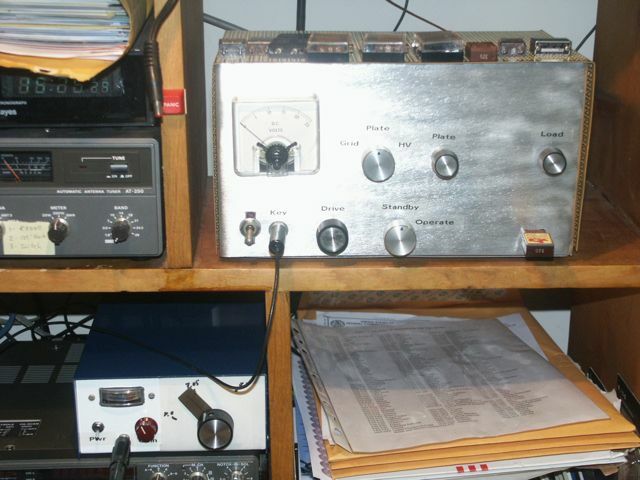 Since building the "Novice" transmitter in December 2006, I have enjoyed operating it every Straight Key Night since. It's probably the only time I have this transmitter on the air all year, which is something of a pity, I suppose. 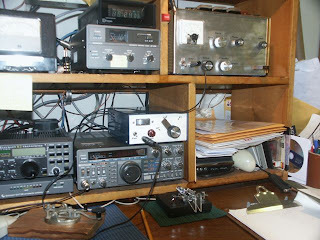 About a week before SKN, I fired up the transmitter to confirm everything is ready and found I could get no power out. I could hear the oscillator pretty well, but there was no grid current and no plate current. Opening up the base plate immediately showed the problem: a 2.2 k 2 watt resistor in the oscillator plate circuit had overheated, and it had unsoldered itself from the terminal strip on which it was mounted. I replaced it with a 3.3 k 2 watt resistor, mainly because it had shifted in value to over 4.5 k! After that quick fix, the transmitter worked as it should. This year was fortunate that I had my pick of operating time for SKN. As you can see in the picture, I had merely to ignore the modern equipment on the desk and enjoy exercising the homebrew year with my 35+ year old Japanese J38 clone key. One of the consequences of being crystal controlled in the modern era is the certainty you must call CQ. This was not a problem this year at all. With 50 or so watts out, I had no trouble getting answers on my dipole. 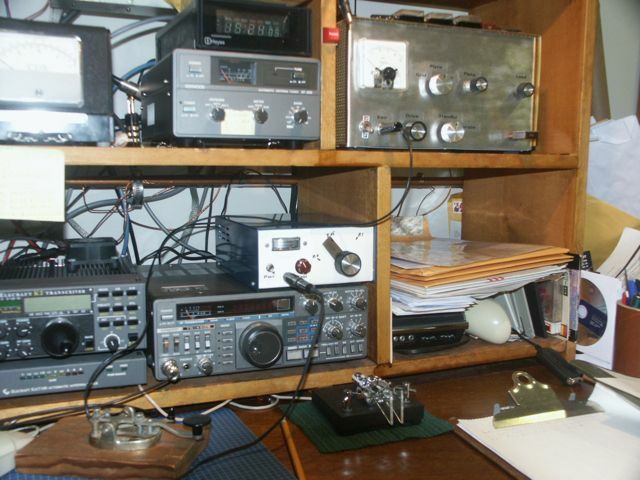 In fact, several times, I was called after finishing up a QSO. My biggest difficulty was my arm kept getting tired. After about an hour of QSOing, I needed to take a short break to let my arm rest. Using a straight key is a lot of work. In all, I worked an even dozen contacts. Six of those were stations in Texas. I enjoyed working Bob, KE5LYW, who I found out was a fellow pilot. 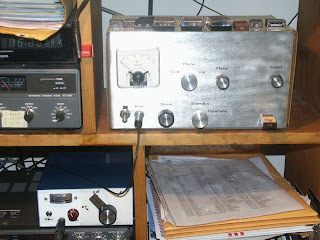 I also had a great QSO with N4HAY, who was using a homebrew single-tube 6L6 transmitter running about 2.5 watts. convenient location of the crystal holder this year. Attentive readers should notice the transmitter sports a new front panel feature -- a crystal socket. This is much easier than reaching around the back of the rig to plug in a crystal when changing frequencies. Only glitch I had was a bit of stability problem with the receiver. On a couple of frequencies, it would drift around a bit when the headphone cable was moved. If you note the very long set of adapters I used for the headphones, that may have contributed to the problem. I'll have to sort that one out for next year. Other than that, the receiver was a real pleasure to listen to, most likely due to the addition of a few capacitors. 2011 was a great outing for this homebrew gear. SKN is always a blast, and a dozen contacts this year beats any previous year. Join me on the air next year.